FOLLOWING a busy summer the Regional Cultural Centre in Letterkenny will play host to a series of concerts and new exhibitions over the next months. Kicking off the autumn season is a powerhouse trio of Irish traditional music – Maighread Ní Dhomhnaill, Máirtín O’Connor and Séamie O’Dowd on Friday 14th September at 8pm. For this very special tour presented by Music Network, the swashbuckling musical spirit that has seen O’Connor and O’Dowd dazzle audiences in the past provides an anchor to the shimmering vocals of Ní Dhomhnaill, with the promise of free-flowing instrumental duos to boot. Maighread Ní Dhomnaill, who has very close family ties to Rann na Feirste in the West Donegal Gaeltacht, formed the band Skara Brae before touring the world with Donal Lunny’s Coolfin. She sings and tours most often with her sister Tríona and their recent concert performances with Martin Hayes, Denis Cahill and David Power have met with widespread critical acclaim. Máirtín O’Connor’s dexterity and versatility on the accordion have seen him perform with a veritable who’s who of trad legends including Midnight Well, The Boys of the Lough, De Dannan, Skylark and the Riverdance orchestra. One of Ireland’s foremost trad musicians, Séamie O’Dowd is a renowned multi-instrumentalist most associated with his performances as a member of trad powerhouse Dervish. Popular singer Jonathan Smeaton unveils his eagerly-anticipated latest album, Drawing to the light, at the RCC on Thursday, 20th September. The Ramelton-based man will be joined a host of well-known local musicians, including Billy Robinson, Pat Crowley, Declan McClafferty, Peadar Coll and Laurence Doherty. Jonathan has been writing songs since he was twelve years old. Born in Dublin, he came to Ramelton via Belfast where he sang in the Choir of St. George’s Church, where his father, Brian Smeaton, was a curate. He quickly found his feet in the rich and varied musical heritage around Ramelton with somewhat tentative fledgling performances in the early eighties. Half a lifetime of experience and adventure later, he has become a sure-footed confident artist and live performer, who communicates his music with passion and heart. Admission €10. Marking the launch of the 2018 Django Sur Lennon Festival, the Regional Cultural Centre is delighted to host the Romain Vuillemin Quartet on Friday, 27th September. 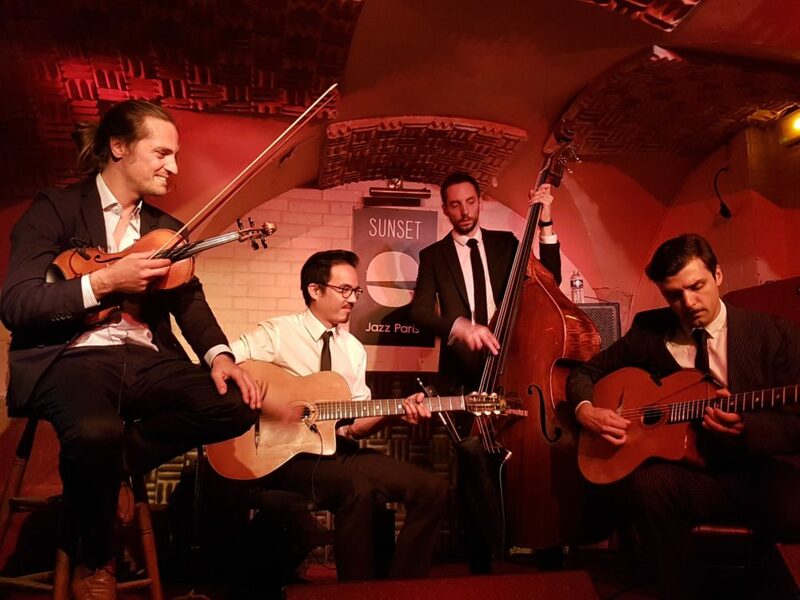 The band was born in 2011 in Paris, and played all the famous jazz and gypsy clubs of the capital (Atelier Charonne, la taverne de cluny, le Sunset, les Petits Joueurs etc), as well as abroad (The Quecum Bar in London, Harlem Jazz club in Barcelona etc) and festivals such as the Hildesheim international Sinti festival, Jazz en Touraine, Django Festival in Liberchies, Django Reinhardt festival de Fontainebleau (ex Samois sur Seine). The RCC is thrilled to play host to East London five-piece folk band Stick In The Wheel, headed by singer Nicola Kearey, and guitarist/producer Ian Carter, on Friday, 26th October. Their debut “From Here”(2015) was fRoots magazine Album of the Year and a MOJO Folk Album of the Year, with four BBC Folk Award nominations since their inception in 2013. Known for Kearey’s fierce, working-class delivery, this is culturally and politically switched on music, with the group being widely commended for their timely appraisal of English Folk, and their skill in telling stories through song that reconnect modern audiences to the past – drawing unexpected parallels between then and now. Their second album ‘Follow Me True’ is released on 26th January 2018. The songs within examine rituals and cycles, our inherent power to change ourselves and the world around us, the past repeating itself, ghosts and death, land and place, thieves and beggars. Pushing the boundaries of this music hard, with such energy and intensity, has brought connections with new, modern audiences, who can’t get enough of this vibrant band. Admission €15/€12. The summer season at the Regional Cultural Centre included a wide variety of exhibitions and the autumn season will be no different. From September 21st – October 20th there will be a photography exhibition, Twin Town – Rudolstadt, to celebrate Letterkenny’s twinning with Rudolstadt in Germany. Andreas Irmscher is a German photographer from the town of Rudolstadt, Thuringia which is set to officially twin with Letterkenny on October 1st this year. As part of the official German delegation travelling over to Ireland at the end of September for the signing, this exhibition will showcase Irmscher’s photographs of our new twin town with all the charm and historical character it has to offer. The exhibition will also include some photos of his favourite spots in Donegal. Andreas is also the president of Rudolstadt Photography Club which will visit Letterkenny as part of their Donegal tour next year. Well-known Donegal artist Paul Rooney makes a welcome return with his latest exhibition, Inside Looking out from October 9th – October 27th. Letterkenny artist Paul has worked in various areas of the art industry, including the ‘Wider Horizons Programme’ at the University of South Western Louisiana at Lafayette developing work in painting and print-making. His work is in private collections in Ireland, Britain, France, Holland, Germany and the United States and in Irish public collections including Donegal County Council, Office of Public Works and Letterkenny Institute of Technology. For more information on all events log onto www.regionalculturalcentre.com. Tickets for all concerts are now on sale and available from the box office on +353 74 9120777.